This is one of the most interesting surnames. It is of French locational origins, and a genuine example of a survivor from the famous Conquest of England in 1066. First recorded in the later Domesday Book, the original name holder Ralph de Havile, fought with Duke William of Normandy at the battle of Hastings. His conduct was such that he was later rewarded with a grant of large estates in the counties of Warwickshire, and later Norfolk. The surname originates from the village of Hauville in the French departement of Eure, or from Hauteville La Guichard in La Manche. 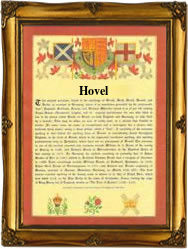 The modern spellings include Havill, Havell, Hovell and Hovel. Early name development includes recordings such as Ralph de Hauvill of Norfolk in 1155, Henry de Hautvill of Berkshire in 1242, and Alice Hovell of Warwickshire in 1464. The first recorded spelling of the family name is shown to be that of Ralph de Halvile. This was dated 1086 in the Domesday Book for Warwickshire during the reign of King William Ist of England, 1066 -1087. Surnames became necessary when governments introduced personal taxation. In England this was sometimes known as the Poll Tax. Throughout the centuries, surnames in every country have continued to "develop" often leading to astonishing variants of the original spelling.